Hey Eugenia, I just saw that this was released. It definitely is a step in the right direction. With the integrated ND filter…how close will that get us to the ever important 1/48th shutter speed we will need? Do you think in most circumstances, we will still need to stack additional ND filters? Now I just have to make the choice between the S100 and the Nikon P7100…the Nikon doesn’t have 1080p but it does have a microphone input…which will be good for scratch tracks…in addition to my Zoom recorder. Also, the processing power I’ll need will be greatly reduced shooting in 720p. What I don’t understand is the SX40 HS. At that price, they should be using a bigger sensor. When I first saw that camera, I figured it would have the same sized sensor but at a lower cost. One of the two is about $50 to $100 overpriced. BTW – congratulations on your improving health!!! You can never know. Definitely closer than no-ND at all, but without manual control you can never know. >we will still need to stack additional ND filters? If you need even more control, yes. I probably won’t add any additional though. >microphone input […] in addition to my Zoom recorder. If you have a Zoom recorder and a good mic for it, then you don’t need a mic input on your camera. You just need a sound boy. >processing power I’ll need will be greatly reduced shooting in 720p. So will be quality. Sony Vegas Platinum 11 or Pro 10 are fast decoding Canon’s 1080p h.264 streams on modern PCs. Personally, I’d go for the S100. The P7100 has a slower lens, and being Nikon, I’m guessing that their bitrate and encoder quality will be atrocious. >congratulations on your improving health!!! Hey Eugenia, thanks for the quick reply. I vaguely remember reading one of your posts that claimed that you can check the exposure by taking a photo and then checking the properties? If that’s the case, then I guess I can check the included ND filter before purchasing others to stack. As far as the microphone goes…you’re right I wouldn’t need a microphone input since the Zoom Recorder would be my main source but since the cameras cost about the same amount the added bonus of having a decent microphone for a scratch track, or when a sound guy is unavailable makes that feature very alluring. As far as 1080p quality versus 720p quality…obviously I agree that 1080p is much better but under the circumstances I’m not sure if many amateur/indie filmmakers can get the most out of 1080p with such small budgets. I am using a new Mac Mini that I share with my girlfriend. I currently have iMovie11. I might get Premiere Elements for Mac but I’m not sure yet. Depending upon the necessity, I might look into getting Final Cut X when I am in post but I don’t think I’ll need it. Most of my editing will be pretty straight forward. Once again you are correct that the bitrate is considerably smaller with the Nikon but I read somewhere that it is hard to compare the bitrates on Canons with Nikons because they use a different system and Canons need the higher bitrate to compare with the system Nikon uses. I forget the actual info so sorry for the cryptic explanation. With your music videos did you find that the artist didn’t take you as seriously when you used a P&S camera. I know from working with actors that it is hard to find decent ones that will act for no pay, when you add equipment that looks less than professional, to the mix, it will be that much harder…another reason I think the P7100 is a good choice…it looks more like a DSLR than the S100 does. I apologize if I seem argumentative I just value your input and appreciate the back and forth discussion. It’s a trick, but not a reliable one. Different DSPs and algorithms are used in photo and video modes, so it’s not a guarantee. It’s just an approximation. iMovie does not support 24p, so it’s useless for what you want to do (shoot a 24p movie that is). iMovie adds pulldown on 24p streams and makes them 30p, destroying your cadence and adding ghosting by resampling. You need to go either PE9+ or FCP-X I’m afraid. Nikons have demonstrated to have lower visual quality because of lower bitrate and/or encoder settings. Just look on any of directly-out-of-the-camera videos online. I have downloaded quite a few over the last year, I didn’t like any. They looked like Kodak videos. Yes, a little. But they changed their mind when they saw the final product. My opinion is that it does not make sense anymore to buy this kind of camera for video because the prices of compact iLCs (m43, NEX) dropped significantly. You have to give $100 to $300 more but the advantages – starting from the big sensor – are huge. Andreas, the problem with the 4/3s dSLRs is that their bitrate and frame rate options are usually pretty bad compared to Canon’s offerings (especially Sony’s). Plus, you’d need lenses for them, skyrocketing the price. Even with the small body, they’re still not as small and pocketable as a P&S is. For me, the only camera higher up than the S100 is the Canon T3i. A real dSLR with serious video features. In between, I see a void. I wouldn’t buy any of the cameras and camcorders in the price range between these two cameras. I’d use a serious video camera like the T3i for serious filmmaking, and the pocketable good-enough S100 for the rest of my videos. I don’t see why I’d get a sweet-but-not-quite-there video-wise 4/3s dSLR as my only camera, because such a camera would not be best for both high-end projects & on-the-go snapping. A T3i and the S100 play these roles better IMHO. I mean, sure, some people might prefer to buy a $600 4/3s dSLR which will be mediocre video-wise, a few lenses, and be done with it. I prefer to buy a good video dSLR like the T3i, and a pocketable one with good-enough video controls. I might end up paying a bit more, but I know that I won’t be limited when shooting for each specific occasion. I’d have the right camera for the right shoot. With the current 4/3s dSLR offerings at that price range you are always limited one way or another, video-wise. You’ll have to pay much more to get something decent. >What I don’t understand is the SX40 HS. At that price, they should be using a bigger sensor. When I first saw that camera, I figured it would have the same sized sensor but at a lower cost. One of the two is about $50 to $100 overpriced. Small sensors are why the superzooms can be made so relatively compact. I think the new Sony NEX does support 1080 24p…I think…but it costs more than the T3i, so why bother…it’s not like the T3i is that huge. I’m actually surprised the price of the T2i hasn’t dropped more than it has. BTW iMovie11 does support native 24p. >iMovie11 does support native 24p. That’s excellent news then. If you don’t need more advanced features, then it’s a good editor to do narrative editing. zima, what sized sensor does the SX150 use? I guess it’s shooting at 720p if it’s using a CCD? Price? Good point about having some sort of portfolio. My goal is to make a narrative feature using one of these small P&S cameras…I always thought if I was going to take the time to make a short…I might as well take the extra time and make a feature but your point makes logistical sense. The Idea I have been messing around with could work with a 3 minute trailer/short that could still be used in a feature. >what sized sensor does the SX150 use? I guess it’s shooting at 720p if it’s using a CCD? It’s a classic Canon P&S Digic4 with 1/2.3″ sensor, and 720/30p. Not sure if it locks exposure in video mode. Not that great for your case anyway. Costs $250. Eugenia, there was always a work around with previous versions of iMovie anyway. You can import the footage as a PAL project and it would just add an extra frame and then export it as 24p(23.9…) It’s just a little bit of a pain to count out your frames. Have you ever done any color correction using a photoshop program? It’s my understanding that you can turn all of the frames into single jpegs or pings and do a batch color correct? It makes sense and for Zero Budget Filmmaking it’s definitely a cheaper alternative to After Effects. It’s a pain in the a$$, and I don’t recommend it at all (plus, it’s a bit off topic here). I did it for 3 seconds of video re-touching once and it took a long time to go at it frame by frame (24×3=72). Plus, adding back thousands, if not millions for a feature film, of PNG images to a video app could easily crash it. If you don’t need to do retouching, and as long as Photoshop can re-export in ProRES, then it might be a possibility but you will need to buy a huge external drive (or two) for it. Use your money to buy FCP X instead, so you don’t need to do any of these extra steps. Yeah, it sounded like it might be a pain but I thought…anything I can do to save a buck. Just curious, why did you do it frame by frame? It is my understanding that you do one frame and then the program will repeat the parameters on every other frame…so in a feature movie with around 40 scenes…it would take 40 different gradings. Anyway, that’s something I’ll worry about when I get to post…sorry I hijacked the thread with irrelevance but it popped in my head and I was wondering what you thought. One last question and I’ll leave you alone…which is more important bitrate or sensor size? JK, one more question…haha…sorry. If you were to use this camera and shoot in B&W…would you still use the “flat” image for grading later? I would think you would still want to be able to push the blacks and get better contrast? Am I correct? It would be unbelievable if you could get the Cinestyle profile for these P&S cameras. If I was a wealthier man I would try to download it into the camera. It was retouching, not color grading. I had to remove a tattoo from the singer’s arm. >which is more important bitrate or sensor size? Both, but if I had to pick only one, for me it’s bitrate. Someone else might tell you something else. I prefer crispy quality visuals without many artifacts, over dynamic range. The extra detail you get with a bigger sensor and better lens will get lost if the bitrate is too low. So bitrate is paramount to have good quality. As for dynamic range, you can always light the room better to help the situation. But for bitrate, if it’s not enough by default, there’s nothing you can do. I’d still shoot flat in B&W yes. As for Cinestyle, you can shoot flat-enough with the S100. Thanks Eugenia…it would take me hours to research the answer to all my questions. If the S100 is replacement for S95, then I expect similar prices, $400 or a bit lower. The upcoming Panasonic FZ150 is supposed to cost $500, but it will have a lot more to offer. Too bad, no focus ring. I’ll probably check this thing, just out of curiosity. If the store I bought my S95 from sell it, I might see if they’ll let me use my own SD card to do a comparison between the two cameras. I’ll give it some earthquake style shake (JJ Abrams style when he shot Star Trek), which I also did for a yet to be released music video where it worked amazingly well on the S95, and if the S100 image goes wobbly all over the place and spills out onto the floor due to the rolling shutter, then I will definitely be sticking with the S95. Eugenia, what happened to your 5Dmk2? That’s something you could do a lot more with now. If you’re really that interested in getting the S100, why not sell the 5Dmk2 if you’re not using it? That way you can just concentrate on that one camera and use it to it’s full potential, which will improve your skills and allow you to get a lot more done, rather than switching from one camera to another all the time. >what happened to your 5Dmk2? I use it every now and then (I used it for a baptism recently for example). But it’s mostly JBQ that uses it, for stills. As I mentioned to Andreas above, I prefer to have a “good” camera for serious shoots (e.g. music videos that take time), and a smaller P&S one for less serious ones (e.g. a music video shot in 2 hours, or travel). This camera is very promising indeed. I just want to put one aspect of it in perspective: the 1/1.7″ sized sensor. Many reviewers will refer to this as ‘bigger’ and more light sensitive than a ‘normal’ P&S camera. Potential buyers must realise that this ‘big’ sensor is still very small compared to asp-c and m4/3 sensors. I pretty sure that the S100’s pictures at iso values above 800 will be very noisy, with loss of detail, and that background blur (isolating the object from the background) will only be possible in macro shots. For me, this is the greatest limitation of any compact (small sensor) camera. It also undermines the chances of creating the so called ‘filmlook’. The fact that the S100 has a cmos sensor is great: no more sensor blooming (purple lines when shooting in a strong light source). I don’t understand the problem with the purple lines. With real film, you get purple lines when you shoot towards the sun. Yeah, that doesn’t mean it’s a nice property. Personally, I prefer to just stabilize my camera as much as I can, than to get purple lines. Others might prefer it another way. Eugenia, before you advised older cheap Canon P&S’s as the best available video cameras for “poor artists” who can spend about $100, yet were able to produce high-quality videos. Now I can only wonder who would actually spend $430 on a P&S if video is the primary purpose? For $399 you can buy Panasonic HDC-SD90: a dedicated video camera with progressive 1080p 60fps 28mbps (AVCHD 2.0), full manual control, 28mm wide lens with f1.8, 40x zoom with exceptional stabilizer, and external mic plug. In my opinion, the price of S100 makes absolutely no sense to name it as the camera of choice for any video enthusiast. Don’t change my words please. I never named it as the camera of choice for “any” video enthusiast. I named it the best *point and shoot* camera for video enthusiasts, which means the following: a kind of hardware that is small, fits in a pocket, it also takes great pictures along good video, and it’s “secondary” to the artist’s main camera (usually a dSLR). This is explained in my reply to Andreas above. Besides, I (and most video artists) would NEED 24p, and 30p (for a little slow motion). The Panasonic doesn’t offer this very important bit. Frame rate is very important in the selection of a camera. For video artists, 60p is only important for slow motion, absolutely nothing else. 60p would make their masterpiece look like Joe’s wedding video. Sure, it’s a great option for sports and travel family men (like yourself, I assume), but not for artistry (except for slow motion to 24p). And this blog is for video art, therefore my suggestions won’t be the same as in for family video — which has a different focus. I believe we have already discussed this in the past a number of times btw. I still advocate for poor artists to buy these $100 or $150 Canon digicams btw (the ones that actually have exposure lock), not the S100. 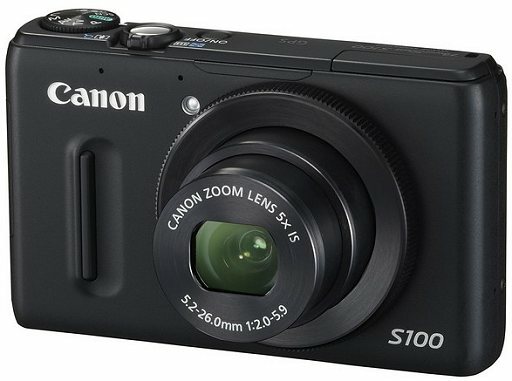 The S100 is simply the best of the current Canon P&S bunch, but not the one that people should aim for if they don’t have the funds. It doesn’t offer THAT much more than the $110 A1200 model video-wise. I go for the S100 because, well, there’s a 10th anniversary wedding gift pending, so I can go for the best P&S. Eugenia…you`re talking about Joe Simon or other?Thanks. I love your blog, and bought my parents a A1200 based on your recommendation, but IMHO, the GH1/GH2 is the best cam for video. I bought 2 GH1s(body only) on closeout for around $350 and that was the unhackable model. The new hack came out two weeks later and I can now record 24p and up to 100mbs. The GH2s are now hackable also and their AVERAGE bitrates are now stable at over 100mbs. You have to spend over $5k to get a better camera. Even stock they’re pretty good and if they go on sale for body only under $500, you can’t get a better cam for similar cost. The GH series have limiting color options, which is important for a pro-look. Canons have the excellent Cinestyle now while the GH have a baked image with little control. Also, the kind of encoder hack currently used to go to 100mbps makes no big difference (very little added visual clarity). What the hack does is to save the buffer at 100mbps, but the encoder itself does not work at 100mbps. This is like saving at 100% quality a previously-saved JPEG picture: since JPEG is lossy obviously the re-saved quality won’t be as good as if we were to have access to the original TIFF uncompressed image and then save a JPEG at 100%. It’s a two steps down process instead of one. A stock GH2’s 720p is as good as 7D’s 1080p. Only thing Canon has over GH’s is low light/high iso. The GH1 high iso low light is terrible, BUT for $350 body only, that’s easy to overlook/work around. The GH2 has much better low light, maybe not as good as Canon, but for $800 body only vs $1500 for a 7D body only, Panasonic wins in terms of Quality per dollar value.